You may ask yourself, Compact States? That sounds familiar but I dont really know what is it. The correct term for it is really The Nurse Licensure Compact. How and Why Did The Nurse Licensure Compact Begin? The United States Congress passed the Telecommunications Act of 1996 in response to the rapidly increasing practice of healthcare by electronic means. The National Council of State Boards of Nursing (NCSBN) embarked on a 3 year journey to develop a model of Multistate nursing licensure recognition that would "remove regulatory barriers to increase access to safe nursing care." How does Nurse Licensure Compact works? The Nurse Licensure Compact allows a nurse licensed in one "home" compact state to practice in a party compact state without seeking an additional nursing license. 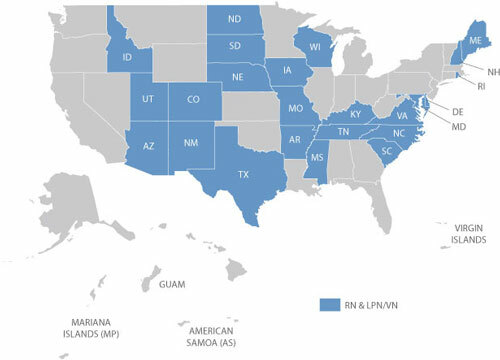 Other states belonging to the Nurse Licensure Compact states are known as "Party" states because their state governments have also agreed to recognize nurses licensed in other compact-member states. This recognition allows a nurse to practice in a party state on his/her home state license. What is the impact of the Nurse Licensure Compact? Mutual recognition of a nurse’s license in states belonging to the Compact increases nurse mobility and facilitates delivery of health care by innovative communication practices such as telenursing. Additionally, the Compact promotes the public health and safety by encouraging cooperative efforts among the party states in nurse licensing and regulation. As more state legislatures enact the Nurse Licensure Compact, the number of party states will increase and the nation will move closer to allowing one home state license to grant a nursing privilege nationwide. nurse’s primary state of residence and practice in all other states in which the compact is in effect. While a nurse's license may be multi-state, permanent relocation to another Compact state requires obtaining licensure in the new state, as their residency has changed. Likewise, a license obtained in a Compact state that is not one's primary state of residence is not mutually recognized by the other NLC members.